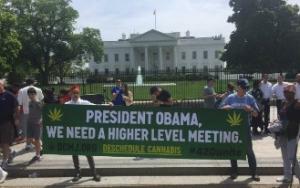 A demonstration headed by the DC Cannabis Campaign and Weed for Warriors is set for the White House Friday after the Obama administration failed to respond to the groups' requests for "higher level consultations" following an initial meeting with White House staffers last month. Headed by longtime DC political gadfly Adam Eidinger, the DC Cannabis Campaign is the group behind the District's successful 2014 marijuana legalization initiative. The campaign's White House demonstration last month led to that initial meeting and to the campaign's call for further meetings. Weed for Warriors is a group dedicated to working with the Veterans Administration to ensure that vets "have the freedom to use medical marijuana as a recognized medical alternative to harmful psychiatric drugs." Organizers are saying the event won't be a smoke-in, but it will come close. "This will be an unpermitted event with mass cannabis consumption and escalated civil disobedience," demonstration promotional materials say. "Support veterans risking arrest!" the groups say. "They will lead a mass die-in calling for an end to the war on drugs." The groups are calling on the Obama administration to deschedule -- not reschedule -- marijuana before the president leaves office in January. 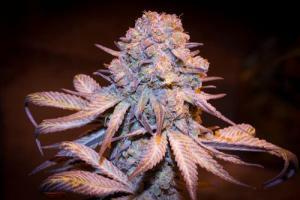 But they are also clear that the ultimate goal is ending prohibition. "You should understand our protests are not just for medical research into cannabis, but ending cannabis prohibition once and for all," the DC Cannabis Campaign said in its letter to the White House earlier this month. "You have the opportunity to heal the national wound of unjust cannabis policies that have always targeted minorities, hurt patients and corrupted policing in America for nearly 80 years." re likely to kill your brother." The bigotry and racism behind Anslinger's attack on marijuana have remained embedded in prohibition, with black people being arrested at a rate nearly four times that of whites. And five million people have been arrested on marijuana charges since President Obama has been in office -- nearly 90% of them for simple possession. "Given the compelling and staggering facts as to why these failed cannabis policies harm Americans, we are sure you can understand why we cannot tolerate your inaction on these important issues any longer," the groups said in their letter to the White House. "We simply cannot stand on the sidelines and watch while everyday more Americans are harmed by what is clearly racist and unconstitutional failed drug policies. This is why we are requesting a formal response regarding the above from your administration before May 20th." That formal response didn't happen, so Friday's demonstration at the White House is happening. 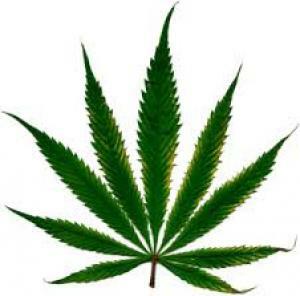 A new Gallup poll released today has 58% saying marijuana should be legal in the US. That ties the 58% reported by Gallup two years ago after support declined to 51% last year. The 58% figure is the highest ever recorded in a Gallup poll, and is consistent with majority support for marijuana legalization reported in other state and national polls in recent months. And Gallup says that figure is likely to continue to increase, thanks to both younger residents more likely to support legalization and the dying off of older Americans, who are more likely to oppose legalization. "Americans' support for legalizing marijuana is the highest Gallup has measured to date, at 58%," the polling firm noted. "Given the patterns of support by age, that percentage should continue to grow in the future. Younger generations of Americans have been increasingly likely to favor legal use of marijuana as they entered adulthood compared with older generations of Americans when they were the same age decades ago. Now, more than seven in 10 of today's young adults support legalization. But Americans today -- particularly those between 35 and 64 -- are more supportive of legal marijuana than members of their same birth cohort were in the past. Now senior citizens are alone among age groups in opposing pot legalization." The poll had majority support for legalization among every age group except those 65 and older. Support was at 71% among the 18-to-34 group, 64% for the 35-49 group, 58% among the 50-to-64 group, and only 35% among those 65 and older. Despite public support for legalization and despite legalization already being the law in four states and the nation's capital, marijuana arrests remain near all-time highs. In 2014 there were 700,993 arrests for marijuana in the United States, nearly nine out of ten of them for simple possession. Black and brown people continue to be arrested for pot offenses at a disproportionate rate. Drug reform activists like what Gallup was selling. "The latest poll results point to the absurdity and even venality of persisting with harsh prohibitionist policies," said Ethan Nadelmann, executive director of the Drug Policy Alliance. "No other law is enforced so harshly and pervasively yet deemed unnecessary by so many Americans. Spending billions of dollars and arresting 700,000 people annually for violating marijuana laws now represents not just foolish public policy but also an inappropriate and indecent use of police powers. More elected officials need to realize that legalizing marijuana is not just the right thing to do -- it's the politically smart thing to do too." "It's pretty clear which direction our nation is heading on this issue. 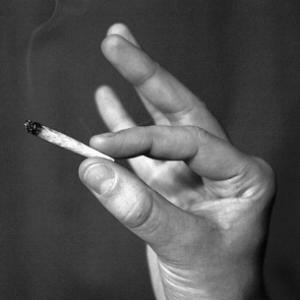 The status quo has shifted," said Mason Tvert, communications director for the Marijuana Policy Project. "Marijuana prohibition has been a public policy disaster, and most Americans are ready to put it behind us and move on. The effects of 80-plus years of anti-marijuana propaganda are slowly wearing off. Once people realize that marijuana is actually safer than alcohol, they tend to agree that adults should not be punished just for consuming it. 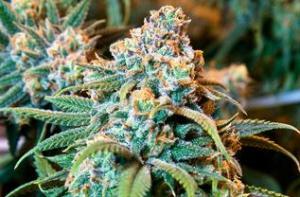 People can see that legalizing and regulating marijuana is going quite well in states like Colorado and Washington. They see the sky hasn't fallen and that regulation works, and they want to take similar steps forward in their states. We will likely see at least a handful of states pass these laws over the next year or so." "These days it's not especially exciting to see yet another poll showing majority support for legalizing marijuana, but 58 percent is very strong share of the American people calling for change, and elected officials should listen," said Tom Angell, chairman of the increasingly aptly named Marijuana Majority. "The constant stream of surveys showing public support for ending prohibition is why we're seeing an increasing number of national politicians saying that it's time to at least let states implement their own laws without federal interference. And we're also seeing a growing number candidates endorsing legalization outright, which shows how mainstream this issue is now. As more states implement marijuana reforms and those laws continue to work as advertised, we're likely to see even more public support, which should soon spur Congress to formally end the criminalization of cannabis under federal law." Ohio votes on marijuana in less than two weeks, and legalization initiatives are likely to be on the ballot next year in Arizona, California, Maine, Massachusetts, and Nevada. These kinds of polling numbers could encourage people in other states to climb on the bandwagon as well. Despite marijuana legalization being in effect in two states last year and decriminalization laws in nearly 20 more, the number of marijuana arrests actually increased last year, according to data from the FBI's annual Uniform Crime Report. "These numbers refute the myth that nobody actually gets arrested for using marijuana. Could you imagine if hundreds of thousands of adults were arrested last year simply for possessing alcohol? That would be crazy. It's even crazier that hundreds of thousands of adults were arrested for possessing a less harmful substance," said Mason Tvert, director of communications for the Marijuana Policy Project. "It's unacceptable that police still put this many people in handcuffs for something that a growing majority of Americans think should be legal," said Tom Angell, chairman of Marijuana Majority. "A record number of states are expected to vote on legalizing marijuana next year, so we hope and expect to see these numbers significantly dropping soon. There's just no good reason that so much police time and taxpayer money is spent punishing people for marijuana when so many murders, rapes and robberies go unsolved." Mexico drug war flares, Colombia coca production jumps, a Texas decrim bill is moving, so is a Hawaii dispensary bill and a Louisiana medical marijuana bill. And more. Coca production is up in Colombia. 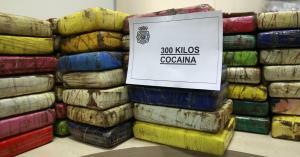 It could end up as cocaine, like this haul seized by Spanish police. 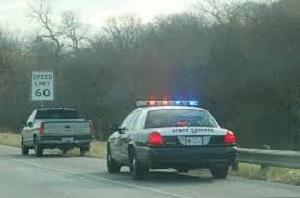 Texas Decriminalization Bill Wins Committee Vote. After failing in a close vote last week, a bill to decriminalize marijuana advanced Monday night. House Bill 507, sponsored by Rep. Joe Moody (D-El Paso) passed the House Jurisprudence Committee on a 4-2 vote. It would make possession of up to an ounce a civil infraction with a maximum $250 fine. Hawaii Dispensary Bill Wins Final Committee Vote. A bill to finally bring dispensaries to the Aloha State has passed its final committee vote and now heads for a final legislative vote. House Bill 321 would allow for eight dispensaries statewide, with each allowed two retail locations and two grow sites. Illinois Advisory Board Expands List of Qualifying Illnesses. The Medical Cannabis Advisory Board Monday recommended adding PTSD and seven other illnesses and conditions to the list of those for which medical marijuana can be used. The decision isn't final; the Department of Public Health must approve. 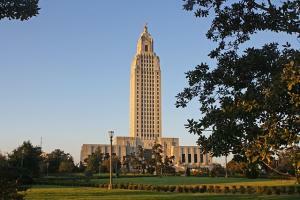 Louisiana Senate Passes Medical Marijuana Bill. The Senate Monday approved Senate Bill 143, which would allow people suffering from cancer, glaucoma, and cerebral palsy to use the herb. 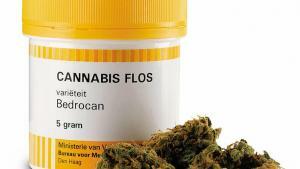 It would create a single grow site and medical marijuana would be distributed through 10 pharmacies. The bill now heads to the House. Missouri CBD Cannabis Oil Expansion Bill Wins Committee Vote. The bill, SB 386, passed unanimously out of the House Emerging Issues Committee Monday. It now goes to the Select Committee on General Laws. Tennessee Governor Signs CBD Cannabis Oil Bill. Gov. Bill Haslam (R) Monday signed into law House Bill 1097, which will expand access to CBD cannabis oil. Missouri Hemp Bill Wins Committee Vote. The bill, HB 830, which would legalize hemp production in the state, passed the Senate Agriculture, Food Production, and Outdoor Resources Committee on a 6-1 vote. It now heads to the Senate floor. Carly Fiorina: "Drug Addiction Shouldn't Be Criminalized." Newly-announced GOP presidential hopeful Carly Fiorina said Monday that the country needs to find a new way to deal with drug addiction. "Drug addiction shouldn't be criminalized," Fiorina said during a conference call with reporters on Monday. "We need to treat it appropriately." She added that "decriminalizing drug addiction and drug use" is good public policy. Gloucester, Massachusetts, Police To Stop Arresting Addicts If They Seek Help. Police in Gloucester say that if drug users come to them and turn in their drugs and/or paraphernalia, they will not be charged with criminal offenses, but will instead be offered treatment in partnership with two local medical centers. "We are poised to make revolutionary changes in the way we treat this disease," Chief Leonard Campanello said. The new policy goes into effect in June. Coca Production Up Dramatically in Colombia. Coca production jumped 39% last year, according to a new White House report. The report comes as pressure mounts on Colombia to end its US-backed program of aerial herbicide spraying on coca crops after the WHO called glyphosate a carcinogen. The reported increase came after six years of declining or steady production. Mexican Government Declares War on Jalisco New Generation Cartel. In the wake of a violent week that saw presumed cartel gunmen shoot down a military helicopter, killing six soldiers, along with shootouts, blockades, and vehicle-burnings, the Mexican government says it is going to war against the Jalisco New Generation cartel, which it blames for the violence. "The full force of the Mexican state will be felt in the state of Jalisco," an official vowed Monday. "Satisfactory results will start to be seen very soon."